Elliott has a wonderful temperament and is a very laid back dog - just like his dad Bill. His name is aboriginal for "companion" and that is exactly what he is - happy to be with you.A big thank you to Dale for showing Elliott at Sydney Royal in 2010 for Reserve Challenge Dog - it was a great thrill. Dale and Elliott do it one better in 2011 - Runner Up Best of Breed at Sydney Royal - thank you once again Dale. 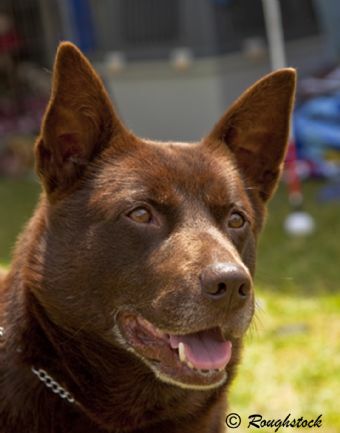 2 days later and Elliott - handled by Samantha takes out Best in Show at The Australian Kelpie Club of NSW Show on Easter Saturday, Well done Sam and Elliott. 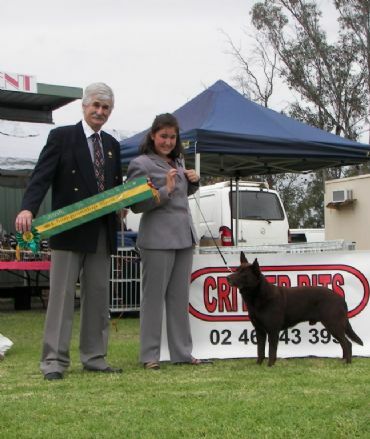 The rest of 2011 has been great we took out a group, a R/U in group and classes in group and to finish the end of 2011 Elliot finished with a bang taking out the Dogzonline Best of Breed pointscore for Australian Kelpie's well done Elliot! 7-Jul-13 BOB, Open of Breed, Short Listed for Best in Group. 9-Sep-12 Best Headed, Best Footed, Best Stifle, Best Topline.